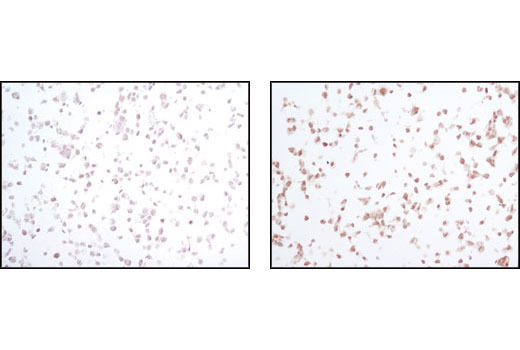 Phospho-SAPK/JNK (Thr183/Tyr185) (81E11) Rabbit mAb detects endogenous levels of p46 and p54 SAPK/JNK when phosphorylated at Thr183 and Tyr185. It will also react with SAPK/JNK singly phosphorylated at Tyr185. 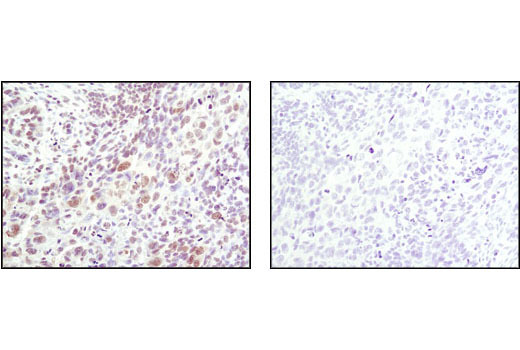 This antibody may cross-react with phosphorylated p44/42 or p38 MAP kinases. Monoclonal antibody is produced by immunizing animals with a synthetic phosphopeptide corresponding to residues surrounding Thr183/Tyr185 of human SAPK/JNK. The stress-activated protein kinase/Jun-amino-terminal kinase SAPK/JNK is potently and preferentially activated by a variety of environmental stresses including UV and gamma radiation, ceramides, inflammatory cytokines, and in some instances, growth factors and GPCR agonists (1-6). As with the other MAPKs, the core signaling unit is composed of a MAPKKK, typically MEKK1-MEKK4, or by one of the mixed lineage kinases (MLKs), which phosphorylate and activate MKK4/7. 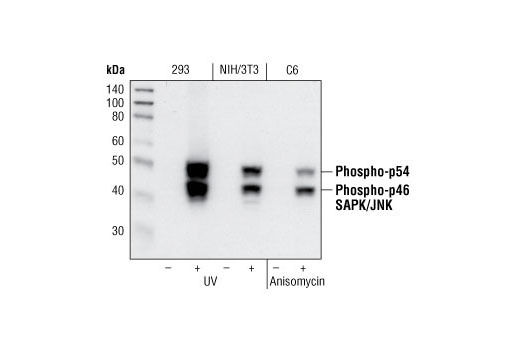 Upon activation, MKKs phosphorylate and activate the SAPK/JNK kinase (2). Stress signals are delivered to this cascade by small GTPases of the Rho family (Rac, Rho, cdc42) (3). Both Rac1 and cdc42 mediate the stimulation of MEKKs and MLKs (3). Alternatively, MKK4/7 can be activated in a GTPase-independent mechanism via stimulation of a germinal center kinase (GCK) family member (4). There are three SAPK/JNK genes each of which undergoes alternative splicing, resulting in numerous isoforms (3). SAPK/JNK, when active as a dimer, can translocate to the nucleus and regulate transcription through its effects on c-Jun, ATF-2, and other transcription factors (3,5). Davis, R.J. (1999) Biochem Soc Symp 64, 1-12. Ichijo, H. (1999) Oncogene 18, 6087-93. Kyriakis, J.M. (1999) J Biol Chem 274, 5259-62. Leppä, S. and Bohmann, D. (1999) Oncogene 18, 6158-62. Whitmarsh, A.J. and Davis, R.J. (1998) Trends Biochem. Sci. 23, 481-485.